My baby is turning 13 in a week. So I knit him a sweater. He picked out the pattern and the yarn. Truth be told, it was a little bit over my head, but I got a lot of help from my friends, and it's all finished. I remember when it only took a few afternoons to knit him a sweater. That wasn't the case here — in fact, this one is a little bit big on me. But he's very happy with it. 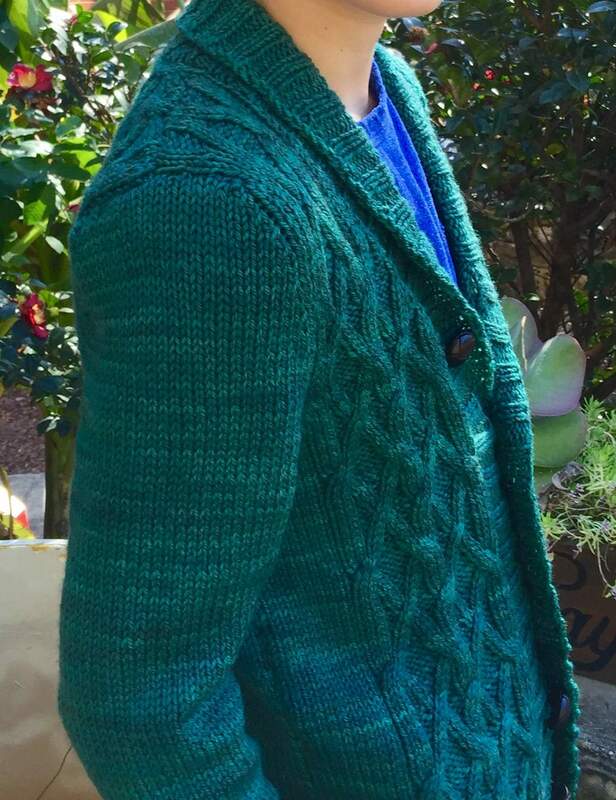 The pattern is Arlo by Michelle Wang. She writes very smart, clear, patterns and seems to be obsessed with cables. I see a lot of her sweaters in my future. The set in sleeves were, surprisingly, not as hard to do as I thought they would be, especially with the help of the Craftsy videos I mention in this post. They went in on the first try. I'm sad that he's not a baby anymore. But he's a nice guy. He gets big bonus points for appreciating hand knits. I hope he's going to have as much fun wearing this one as I had knitting it! Love this sweater, the color is great on your son. The cables really pop and you have done a great job! You are gonna have to beat the girls off with a stick! What a handsome sweater, and the model ain’t bad either. Merry Christmas!